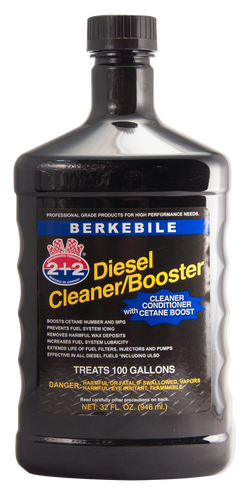 BERKEBILE 2+2® Diesel Cleaner/Booster is a premium diesel supplement used to improve the quality of low sulfur and high sulfur diesel fuel. It also boosts the Cetane number, improves MPG and power, cleans the fuel system of harmful deposits, and adds lubricity to improve engine life. Boosts Cetane Number and MPG! Extends Life of Fuel Filters, Injectors and Pumps! Effective in all Diesel Fuels Including ULSD! - Summer; One quart (32 oz.) treats 500 gallons, i.e., one gallon treats 2000 gallons. - Winter; Add one quart (32 oz.) to every 150 to 250 gallons, i.e., add one gallon per 1000 gallons for 0 degrees F. protection; add 1 1/2 gallons per 1000 gallons for temperatures below 0 degrees F.